Russian President Vladimir Putin congratulated Russians on the 69th anniversary of victory against Nazi Germany in a speech at a military parade in Moscow on Friday. “Sixty-nine years have passed since the end of the Great Patriotic War, but May 9 was, is and will be our most important holiday. This is the day of our national triumph, people’s pride, the day of grief and an imperishable memory,” Putin said. “We must remain worthy of our forebears’ deeds. They fought to the death with the enemy, defending their native land, and they vanquished Nazism,” he urged on Friday morning. 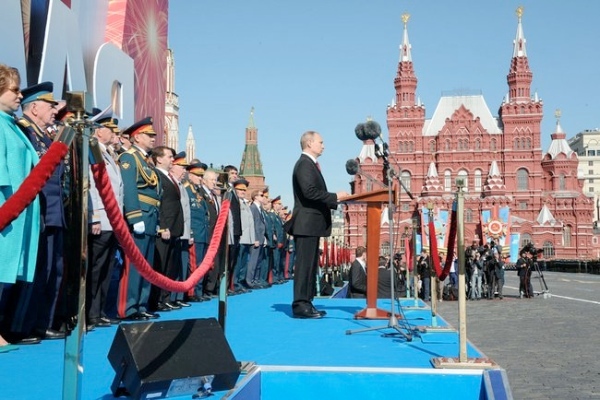 At last year’s Victory Day celebrations, Putin had praised Russian soldiers as “the liberators of Europe”. The Victory Day parade this year involved over 11,000 servicemen, 151 pieces of military hardware, as well as 69 aircraft and helicopters of the Russian Air Force. Cities across Russia geared up to celebrate the 69th anniversary of Victory in the Great Patriotic War of 1941-1945 by holding military parades. Thousands of troops marched through downtown streets along with hundreds of military vehicles, including both cutting-edge and historical models. After a long 23-year pause, the Victory parade returned to Kerch, and Sevastopol to host large-scale festivities. In Moscow, a military convoy was followed by 69 upgraded aircraft and helicopters of the Russian Air Force flying above Red Square. These included Mil Mi-28N Havoc/Night Hunter and Kamov Ka-52 Hokum-B attack helicopters; Antonov and Ilyushin Il-76 Midas strategic airlifters; MiG-29-SMT fighters and MiG-31 Foxhound interceptors; Sukhoi Su-24M Fencer tactical bombers and Su-34 Fullback fighter-bombers; Tupolev Tu-160 Blackjack strategic bombers; and Tu-95 Bear strategic bombers. Tensions have been high with the interim government of neighbouring Ukraine alleging Moscow was planning “‘some form of skirmish” against Ukraine. “They (the Russians) say: ‘look, we … are calling everyone to peace, but it’s the Ukrainians who are guilty of not carrying out the Geneva agreements and guilty of some skirmish they are definitely planning for May 9,” Ukrainian Prime Minister Arseny Yatseniuk told a TV channel on Thursday. Moscow is battling stringent economic sanctions imposed by the US, EU and Canada over the Ukraine crisis, a move slammed by Putin as “illogical”. Earlier on Wednesday, at a wreath-laying ceremony to mark Victory Day, Russian Foreign Minister Sergey Lavrov warned the EU against turning a blind eye to the “rebirth of fascist ideology” in Ukraine. “On Victory Day Russians should remember their duty not to allow fascism to spread throughout Europe and the world at large,” Lavrov was quoted by Russian state media. On June 22, 1941, over 4.5 million German and Axis troops from Nazi-held Poland, Finland and Romania invaded the Soviet Union, in an attempt to conquer territories and seize control of its valuable oil and gas resources in the Caucasus. On May 9, 1945, with the Soviets occupying Berlin, the Germany military had surrendered to the Red Army.